This week has been super busy and flew by! I'm trying to enjoy the gorgeous weather we are having today before winter returns tomorrow. This back and forth weather is crazy! What do you all have planned for the weekend? Todd and I leave for a short babymoon trip to Nashville on Sunday. I'm really looking forward to getting away for a few days...still have a lot to do before we go though! If any of you have Nashville recommendations (restaurants, cafes, sites, etc.) please let me know in the comments below! We planned our trip last minute so we are still figuring out our agenda. Today's casual outfit is perfect for transitioning into the spring season. I've always loved tee dresses but even more so with my baby bump. They are so comfy and versatile! For today's look, I'm styling this striped navy Liz Lange short sleeve tee dress (also comes in bright blue) from Target with white sneakers (love these) and a denim jacket. As I'm entering my last trimester, this outfit is VERY practical for me but doesn't sacrifice fashion! I'll wear this dress all spring and into the summer, too. 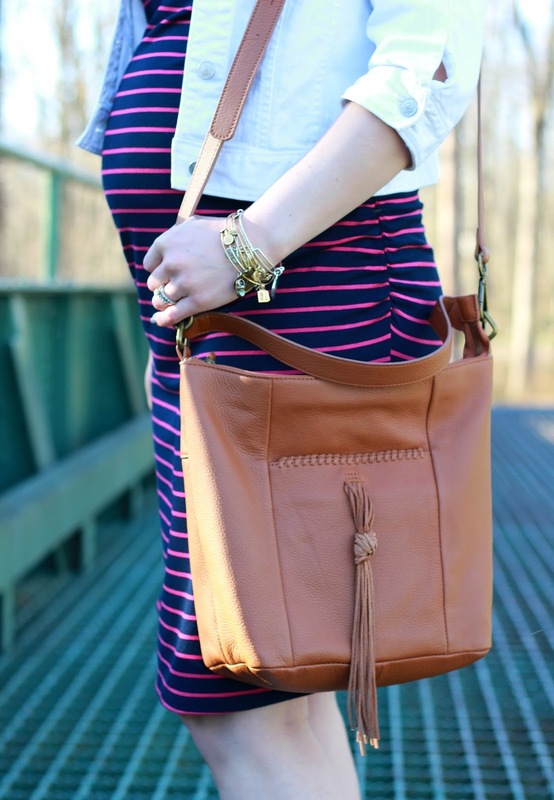 I'm carrying my leather Lucky Brand bucket bag AGAIN because...well, it just goes with everything! It's the perfect casual bag for almost any outfit and it's 65% off right now at Nordstrom Rack! 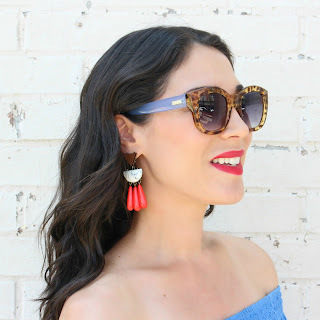 To pull out the pink stripe in the dress, I accessorized with bright pink tassel statement earrings. These were on sale a few weeks ago at Baublebar and are long gone now, but I love these from Baublebar and also these in fuchsia from Target (Sugarfix by Baublebar). 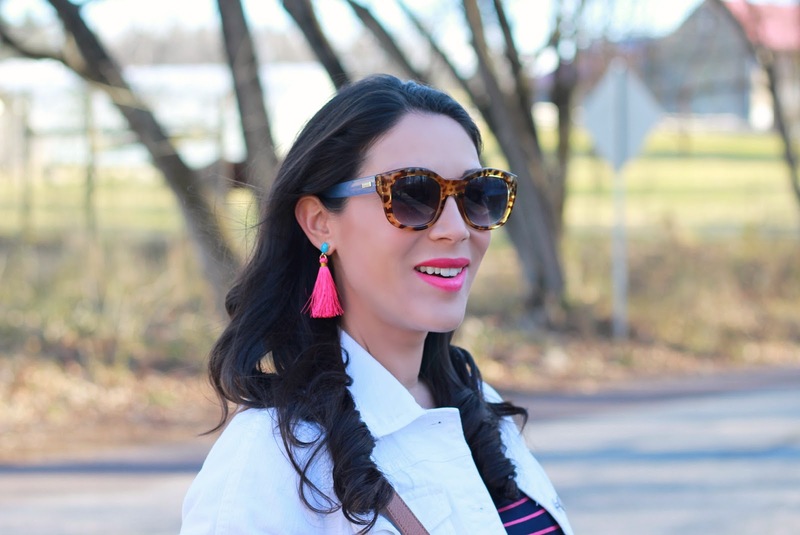 Bright tassel earrings are on trend, fun, and perfect for spring and summer! i totally LIVED in striped target maternity dresses. LOVE this one and especially with the kicks. I love that dress. Wearing them with white sneakers is such a chic casual look! 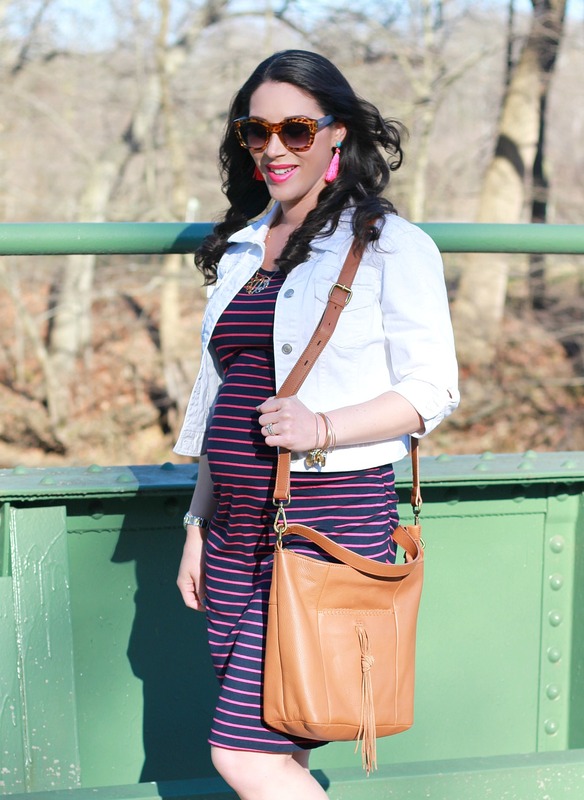 Love your maternity style. That dress is fantastic on you! Love the stripes and kicks, lady! You look gorgeous!